The 50 GI cartridge is a commercial wildcat cartridge developed by Guncrafter Industries for use in select 45-caliber handguns. When I use the word ‘select’ I am referring to the fact that the bullet itself is 0.500” in diameter, so not every handgun is large enough to accommodate such a cartridge. GCI makes a 1911-style handgun and a conversion kit for the Glock 20 and 21 that uses this cartridge. So why would you shoot a 50-caliber handgun when 45 ACP handguns are so plentiful? On the one hand, you are giving up one cartridge capacity in the magazine and gaining a noticeable amount of felt recoil. But you pick up greater lethality than a 45 ACP in the situation of a bullet not expanding in the target (which happens about 33% of the time in real shootings) and in the case of bullet expansion, the 50 GI starts out with greater kinetic energy than a 45 ACP. It is often observed in boxing matches and MMA competitions that the first person to land a solid hit on the opponent has a psychological advantage for the rest of the fight. Not surprisingly, the person who hit first also goes on to win the fight in a majority of the matches. I’ve had the pleasure to own and shoot the GCI Model 1 and I can say that it is a finely-built 1911 style handgun. The term ‘Swiss watch’ tolerances comes to mind because I couldn’t get any part to shake or rattle after the break in period was over. The gun just got smoother to use and had no malfunctions. As you might expect with low-rate production and very high quality work, there is a price tag to pay for everything that went into the gun. My preference for 1911 style handguns is the mil-spec model with the modern tritium night sights... I want my gun to rattle when I walk. This is because a common theme with self-defense situations is that they occur at a time and location that is not convenient for the defender and that is very convenient for the attacker. The reaction to being shot at is to get down and/or get to cover. Your adversarie(S) will know this too and will attempt to surprise you in a location where you have little to no access to cover. This is when getting on the ground is a good course of action if you are going to stay and shoot. There is a lot of sand on the ground and this sand can get in your gun and cause it to stop functioning correctly. Just carrying your gun on a holster for a few days without cleaning will allow lint from your clothing to accumulate in the gun and lint has a similar effect as sand at stopping firearm function. The argument for close-tolerance weapons like the Guncrafter Industries line of 1911s is that the space between parts is so fine that most sand particles cannot get in. I agree with this statement in principle. In any environment, there will be an average grain size for the soil in the area. That means that the tight tolerance gun is ok if the space between parts is less than the smallest grain size in the environment. Since smaller rocks are formed by crushing or eroding bigger rocks, my concern is that the mechanical action of the gun firing will crush the particles into smaller particles that flow handily into the small clearances of the weaker parts of the gun such as the drop safety spring and plunger. Notice how the Glocks polymer frame flexes during the recoil function while the 1911 basically retains its shape. I think that the ‘shake’ from a Polymer frame handgun will help to break the dirt free from tight areas and work it into parts of the gun where it won’t hurt much (like the bottom of the frame.) Nothing is perfect and I encourage you to do like soldiers have done for millennia—keep your weapon clean and dry as much as possible. Ammunition selection for the 50 GI for self-defense is straight-forward. The 185gr and 230gr Copper Hollowpoint offered for sale by Guncrafter Industries is acceptable. If you foresee encountering dangerous game with a handgun, sectional density is your friend. 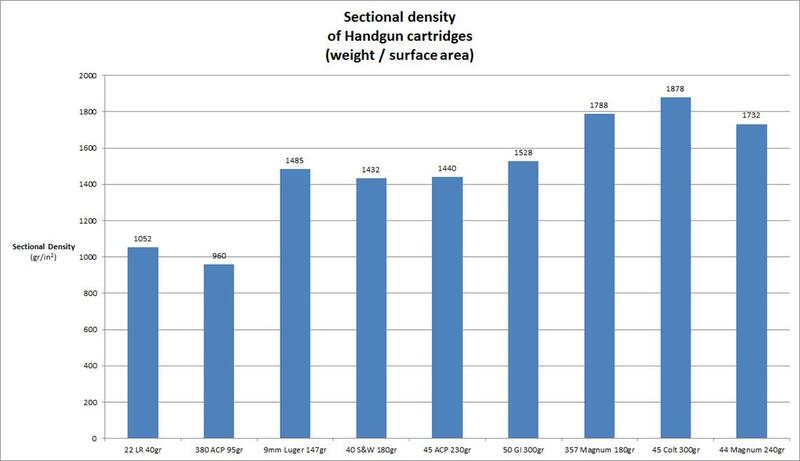 Let’s leave this topic with a presentation of the sectional densities of the various handgun calibers shown in Figure 1. One reason for carrying a revolver in ‘bear country’ is apparent at right—the revolver cartridges have a higher sectional density with common commercial ammunition. The higher the sectional density, the greater the potential for having a deep penetration depth. Semi-automatic handguns hold the cartridges inside of the grip so rare is the handgun that can accept exceptionally long projectiles (which would increase the weight of the bullet and thus the sectional density.) As such, I recommend the 50GI for self-defense against human attackers only. Even with the 300gr solid bullet, you would get as much penetration as you would with a 40 S&W bullet, which is not adequate against animals like brown bear.